We have over 25 year's experience in maintaining and repairing PC and Apple Macintosh computer systems, laptops, notebooks, netbooks, servers, entertainment & handheld devices. Our idea is to treat your equipment in the same way we'd treat ours, make it work, make it robust, and keep the costs down. We can repair most PC & Mac computers down to component level where possible, this means that where some repair centres will quote you for complete part replacements or even whole system replacements we can just repair the part that's broken, possibly saving you hundreds of pounds. 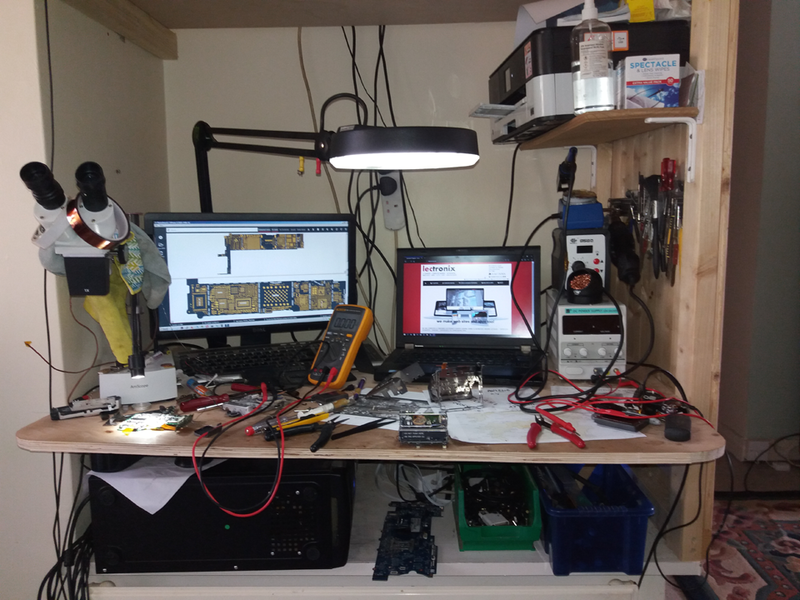 A busy Lectronix workbench. Making broken things work again! We charge £40 per hour, the minimum charge is £40 for both domestic and business customers. We operate a 'no fix - no fee' policy. There is a £10 call out fee if you're not local. We are not currently VAT registered. We usually turn around a repair job in less than 3 days, repairs such as virus removal are quite easy for us to do however we usually require the machine at our office due to the amount of time the removal process can take. All work can be diagnosed and repaired either on-site at your home or business or at our office in Lechlade town centre. We supply any necessary parts and operate a 'no fix no fee' policy. We cover the south part of the Cotswolds including Lechlade, Faringdon, Burford, Highworth, Cirencester, Carterton, Fairford & Swindon. If it's not a local callout there may be a small fee to cover the travel costs. If we cannot source new replacement parts we'll try to source a secondhand working part from our salvage or someone else's salvage stock. If we can't find a spare part at all and the device won't work without it then it is probably uneconomical to repair, this is quite a common issue with laptop/netbook/notebook repairs, the part costs more than the device is worth. In these cases we'll recover your data and recycle the device for you. Sometimes parts are available but overpriced and in that case we'll advise you whether the device is worth repairing or recycling. We don't claim to be able to repair everything, some thing's are just worn out or broken, but we won't give you a tale about what's wrong. We'll try to give you back the same device working like it was when you bought it or at least recover your data. Some computers and consumer electronic devices are complicated, yet cheaply made items which are very prone to damage from mistreatment, viruses & malware. Or more generally they just fail due to poor design or manufacture. The adage 'You get what you pay for' ring's true here! We can work on site or off site at our office in Lechlade, although because of the time it can take to do some repairs you are welcome to drop off your ailing system at our Lechlade office. We hate waste! A lot of computer hardware is unneccessarily upgraded or discarded due to bad advice or lack of knowledge. If your laptop, notebook, desktop computer, TV, games console or smartphone is working but running slowly or is unresponsive don't buy a new one without getting it checked out by us first. There's a fair chance we can do something about it, it could save you a lot of money. Contrary to popular belief it is often NOT true that getting your computer or peripheral repaired is more expensive than buying a new one. We don't sell computer stuff so we have no interest in selling a you a new one! We want you to make the most out of the one you've already got. So unless you have a compelling reason to buy a new computer, TV, printer or other peripheral device, please think about talking to us first.